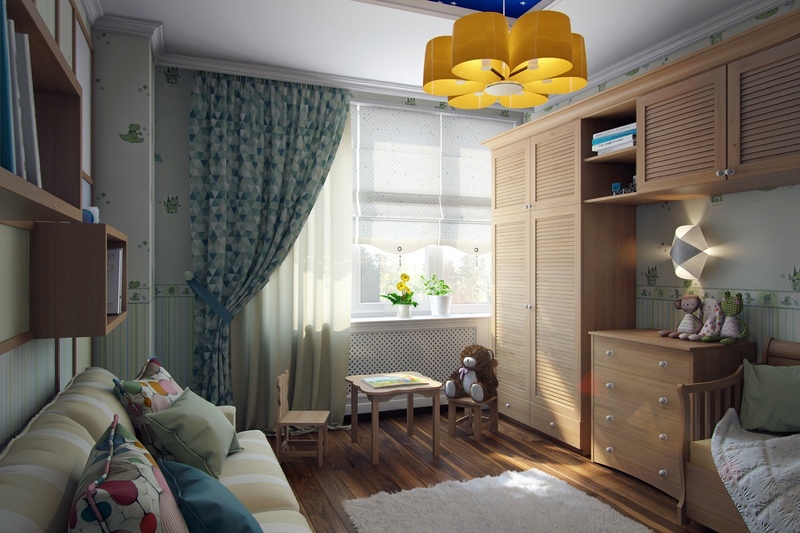 Designing a beautiful room for a child, or children, can be tricky. The best designers, as evidenced in these images from Archivizer, are able to combine the aesthetic preferences of stylish parents with the needs of a child who may have not even formed his own sense of style yet. 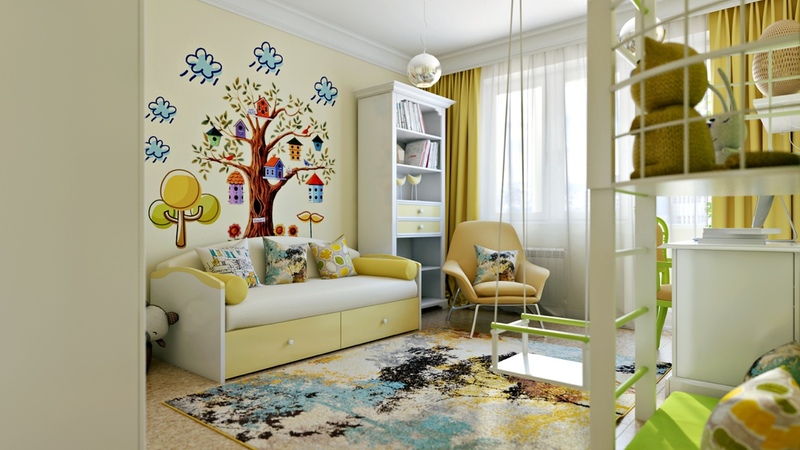 These rooms are colorful, but never garish, with plenty of childlike whimsy to capture your imagination. 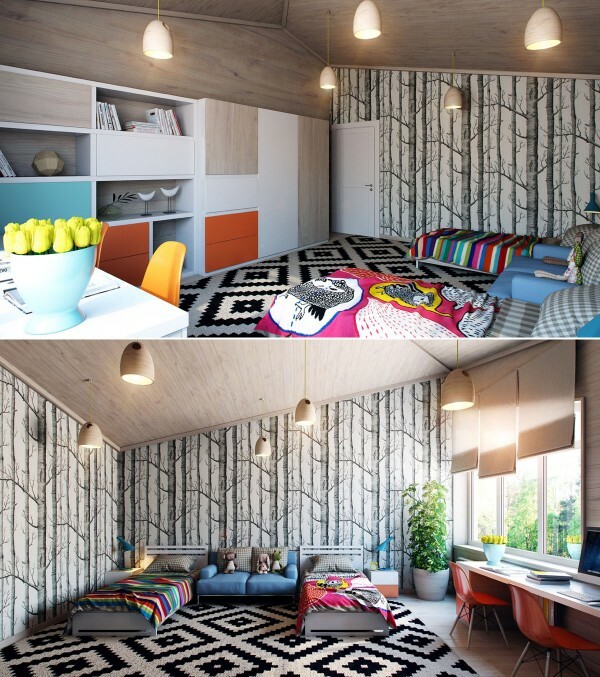 The first room have uses a tree theme to create a really fun vibe. The tree theme runs through the room, most notably in the large tree cut out and the tree print carpet. 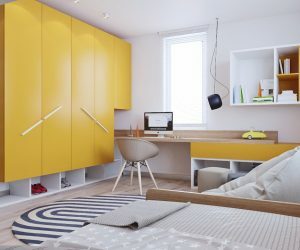 A pale yellow wall and wardrobe lends color without being dizzying. A whimsical tree decal, complete with cartoon rain clouds, adds a few more colors and a lot of personality. 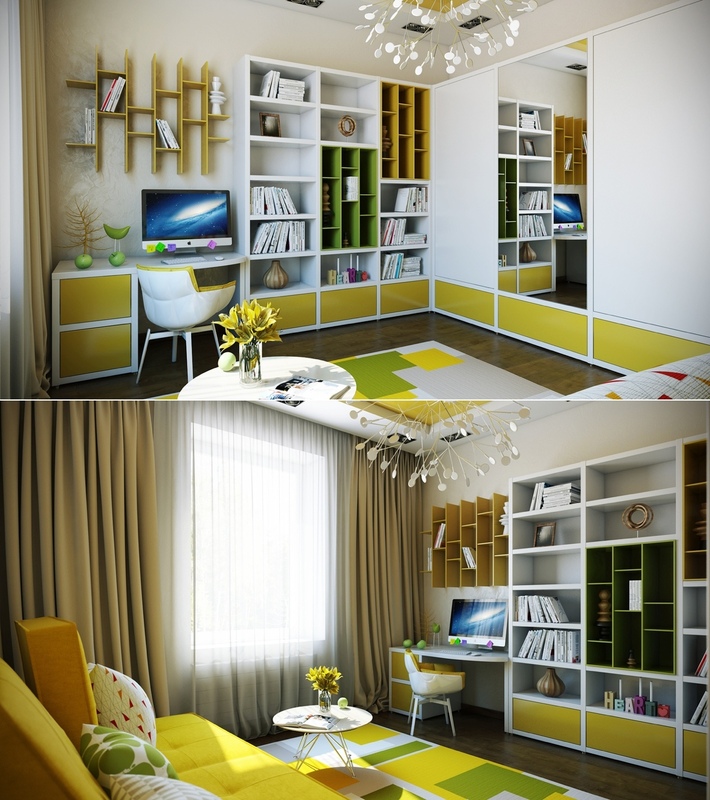 This next room is a little more subdued, but still features plenty of vibrant colors. 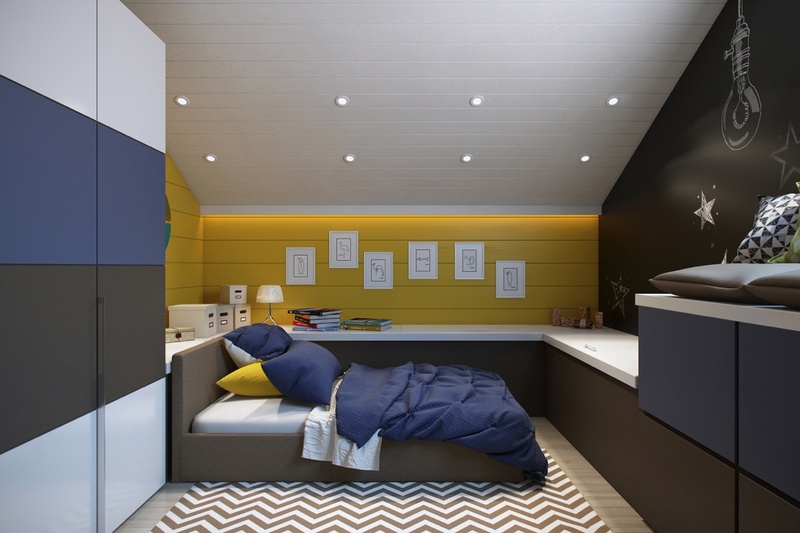 Striped walls and cubby beds make for a perfect retreat for busy kids. 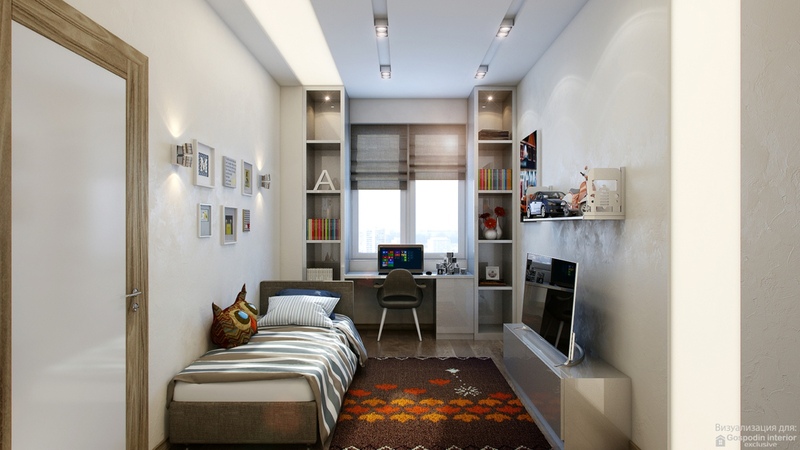 And separate seating and study areas even make sharing a room not so bad. 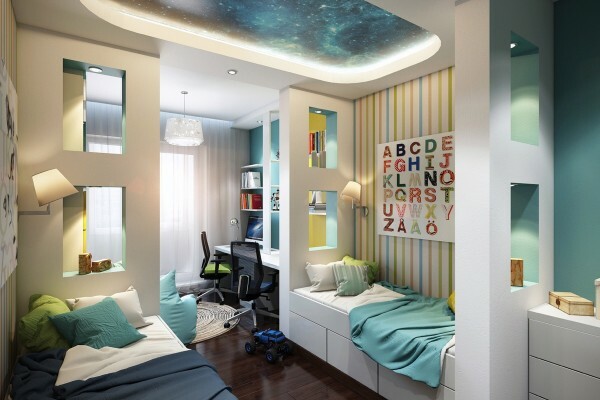 This spacious kids area has more than just beds, tarting with a large play and study area for smaller kids. Chalkboard walls at kid height inspire all kinds of creativity. And a climbing area offers a place to get some of that energy out. When it comes time to rest, kids can retreat to the bedroom area, which features colorful bunk beds. Overnight guests can comfortably crash on this electric pink futon. 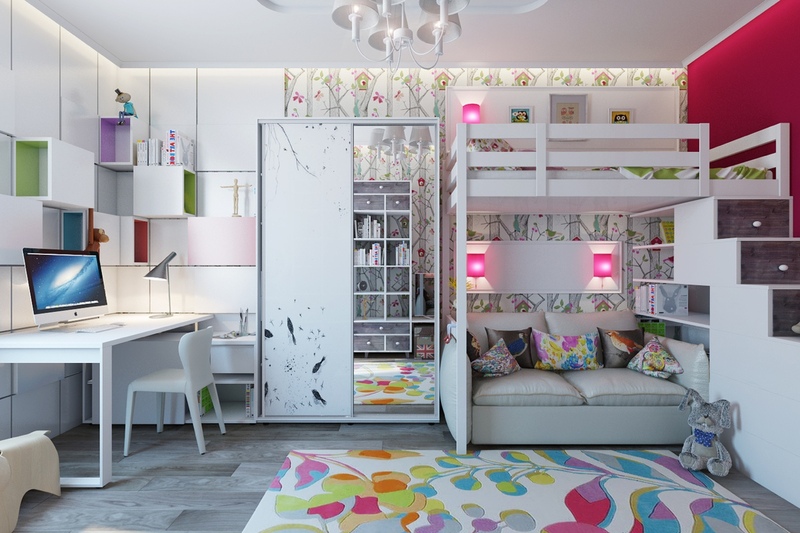 Though this girls room has more subdued colors, its just as stylish and fun. A pretty brand pattern on the walls is welcoming but not too bright. 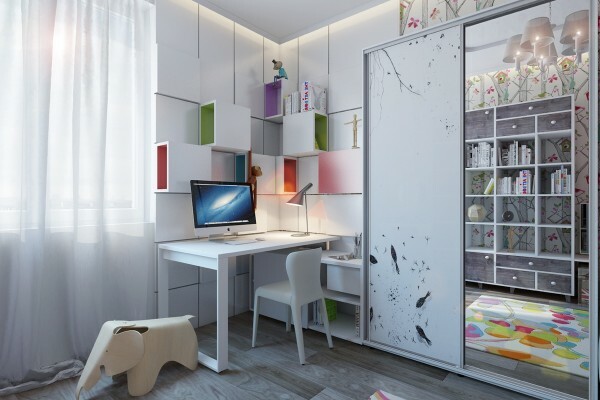 The small study area can easily grow with the girl who lives here. This study room doesn’t try to wedge in any beds, instead creating a comfortable sanctuary for school work or socializing. 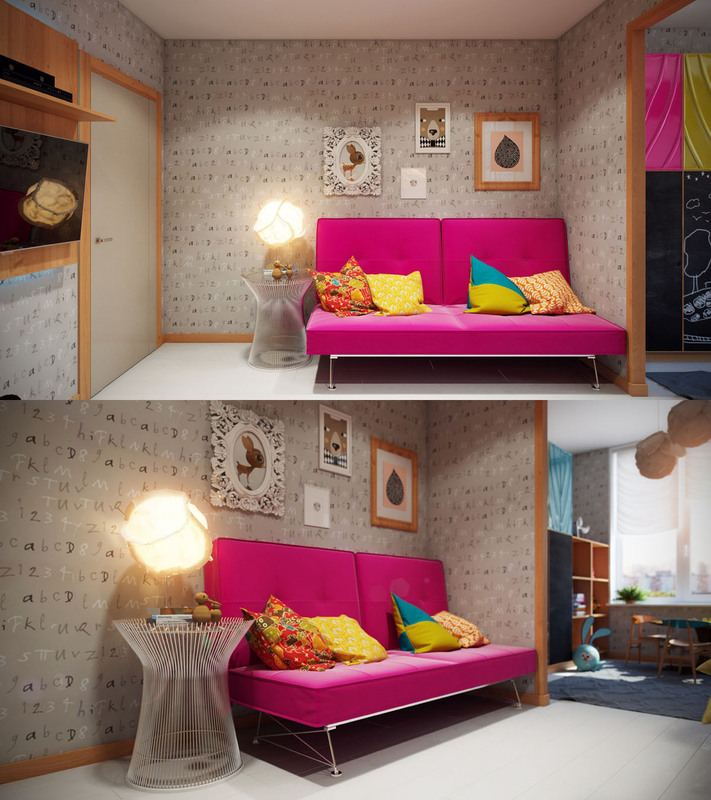 Matching sofas and desks are perfect for sisters while a vanity will surely come in handy for teens. 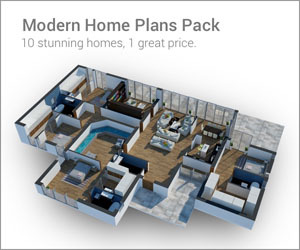 What this room lacks in square footage it makes up for in whimsy. 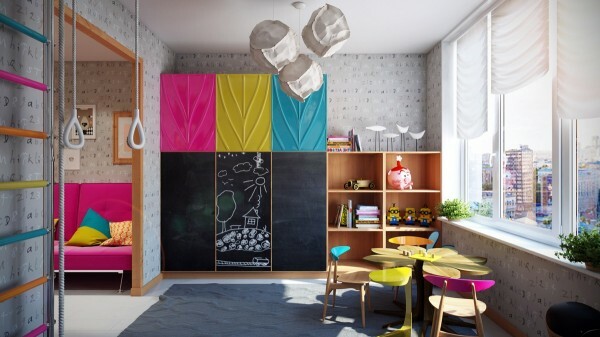 Playful triangle patterns on the wallpaper are reminiscent of flags dancing on the wind. 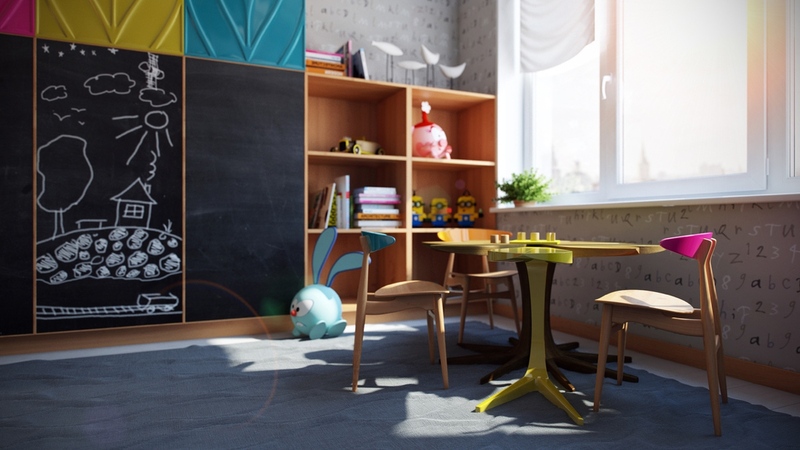 This cozy yellow desk chair and cubby holes can make any homework appealing. 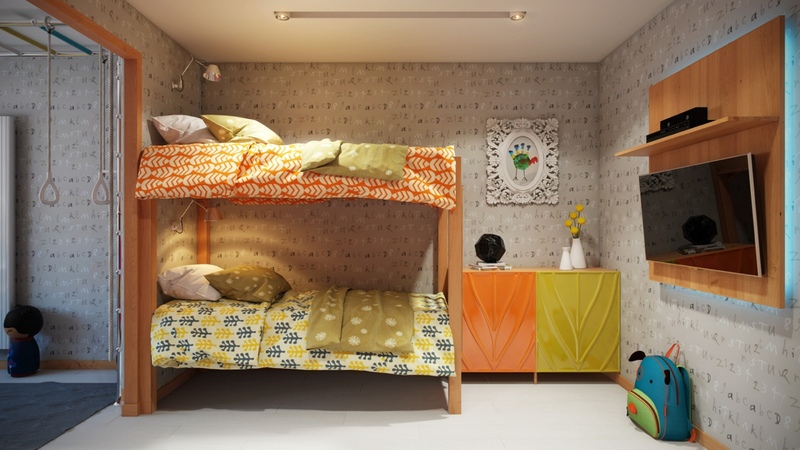 Of course, not all kids have taste that veers towards the silly, as this ultra modern kids room clearly shows us. With subdued tree pattern walls and a tribal-inspired rug, the eclectic design is fun but grown up. 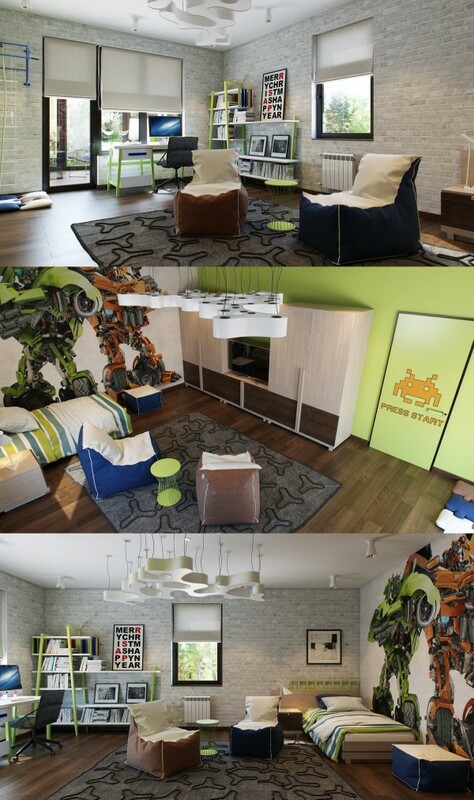 For a wild take on a boys room, check out this space with bean bag chairs and Transformer wall art. The blue wallpaper in this girls room makes it a big dark, so white furnishings and pink and purple accents brighten things up. What little girl wouldn’t want a personalized bed? A simply stylish rocking chair is perfect for bedtime stories. 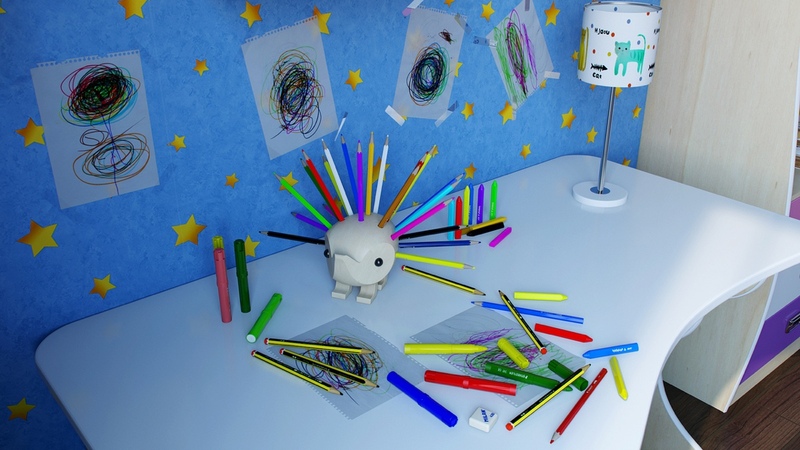 Keep colored pencils readily available with this adorable pencil holder. An attic is an awesome retreat with a chalkboard wall and chevron stripe rug. An awesome map wall is decorative and educational. 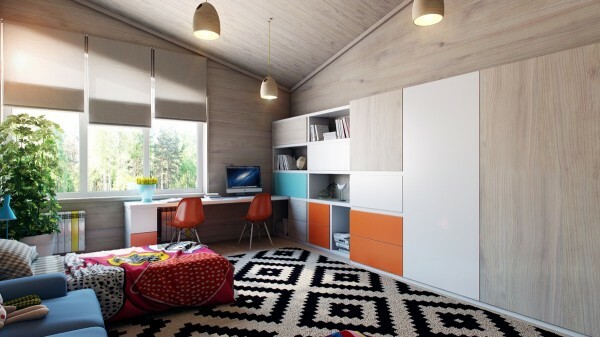 Citrusy colors make this study room welcoming for any age group. While plenty of shelving means you’ll never be without the book you need. A turquoise ceiling is the perfect way to add color without enclosing the space. 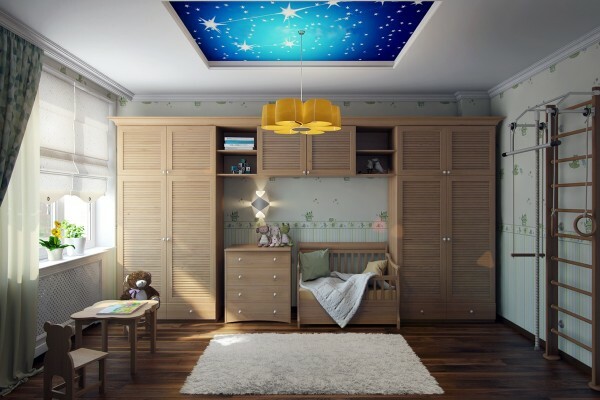 Dark wood floors are beautiful, but you need a throw rug to keep kids (and the floor) safe. 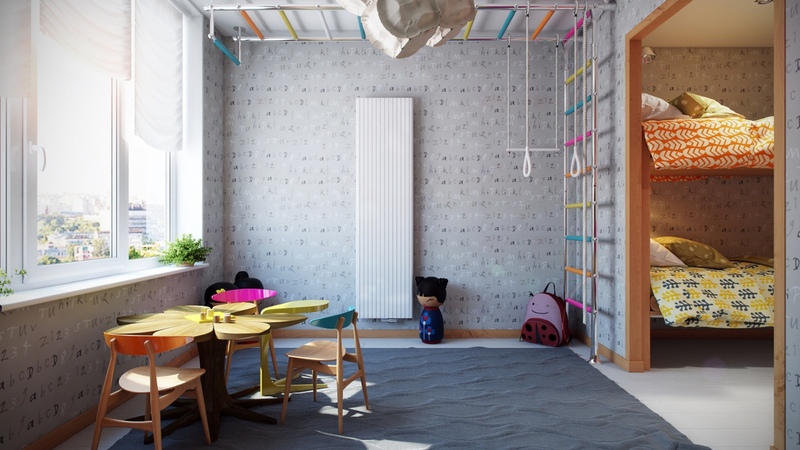 In this play space, you find cozy chairs, and even an indoor jungle gym. The kids’ chairs you see here are the smaller versions of the Panton S chair. The button pattern rug is just precious enough. Whimsical paintings and faux balloons make it feel like a party room all year long. This room proves that you don’t need a lot of wild colors to be kid-friendly. Slatted cabinetry is country chic. A beautiful paint job on the ceiling brings a bit of the night sky indoors in this nursery. 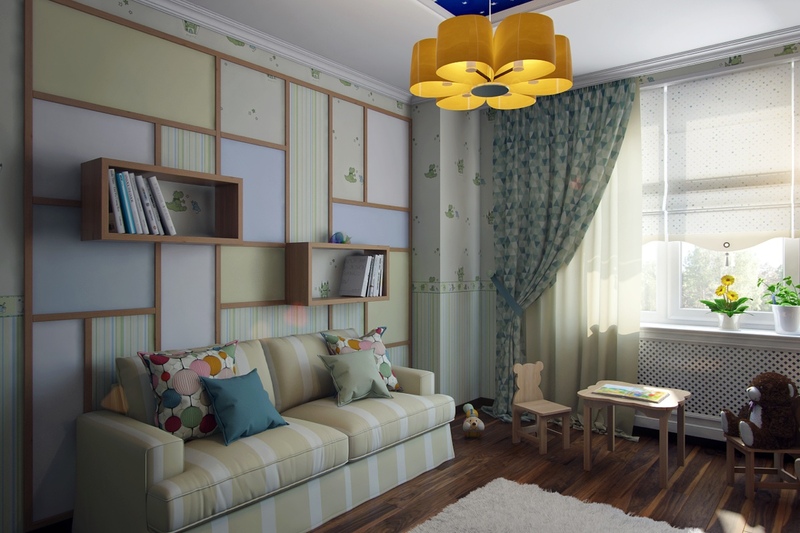 A little couch and tiny table mean kids and parents will feel comfy. Finally, this princess-inspired room with its frilly curtains and chandelier is the stuff little girls dream of.